Granddaughter’s birthday, Mother’s Day, visits from grandparents, aunties, and friends from across the ocean. Hawaiian tradition calls for a celebration when a child turns one because, in olden times, many children did not survive the first year of life. Thankfully, our family’s littlest one is healthy and thriving! 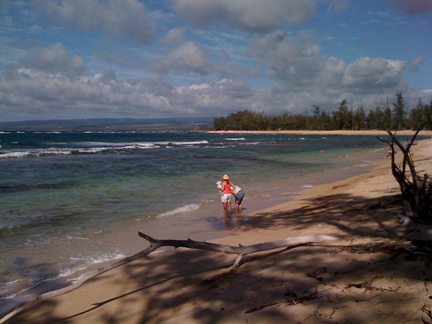 Hauoli la hanau! Opening the imu. It's hot! 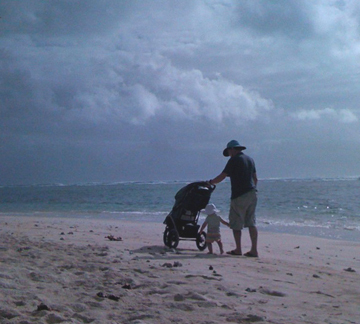 Miss Marvelous and her Papa went for a morning walk along the beach. Let me! I'm one now! 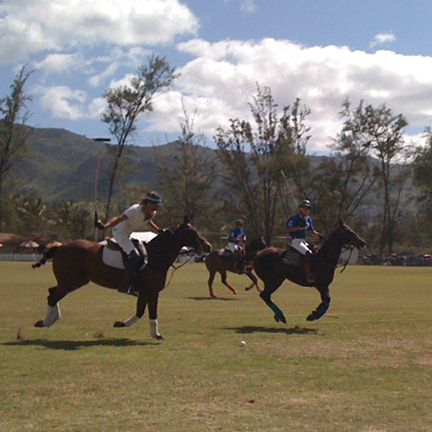 Next day was Mother’s Day, and we took a relaxing drive to Mokuleia on the North Shore to see the polo matches. White team won 4-3. A good day, yesterday. Finished another painting. Caught up with Naomi at the park. Introduced baby and tried our luck at restaurant. Ate pasta with my friend Jan. Bought some starter veggie plants. Even put them into the ground. Every day, almost, my health improves. For now I’m simply going with the flow. The Rope Swing. 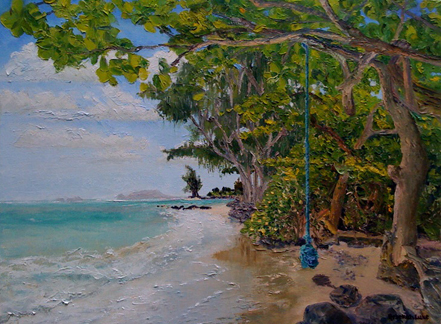 Painted at Kalaeokaoio Beach Park, Kaaawa. It’s historical. The swing is gone. My friend Naomi. A painter and a sculptor. I hadn’t seen her since before Thanksgiving. February’s around the corner. Punahou Carnival time! and we compare art notes. She’ll have six of her whimsical ceramic sculptures at the carnival Art Gallery, and I’ll have two oils. As a featured artist, she gets to start with more than two pieces in the show. I think she’s a featured artist because her work always sells! Way to go! Lunch with Jan. I had a lunch date. Until I’m driving again, DH is my chauffeur. I said, just bring baby along, I really want to see Jan. If it becomes unmanageable, then go on ahead, I’d take the bus home. You see, we were not sure how it would work out. The restaurant. 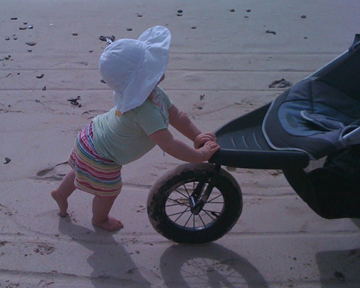 At 8 months the baby is starting to express herself and crawl about. As the adults traded our latest stories over pasta, baby sat and ate so very nicely, checking out the other diners. She really is Miss Marvelous, already preferring shopping and going out with the girls! 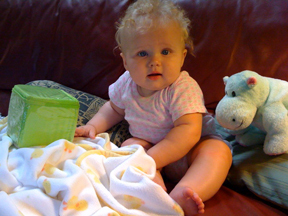 Miss Marvelous’s primary daytime caregiver four days a week is Papa, her grandfather (a.k.a. DH at Rebekah’s Studio). On those days Popo (that’s me) is the backup caregiver, chief cook and bottle washer—literally. This is the first time I’ve had a baby at home. It’s a delightful distraction, or attraction, I should say. 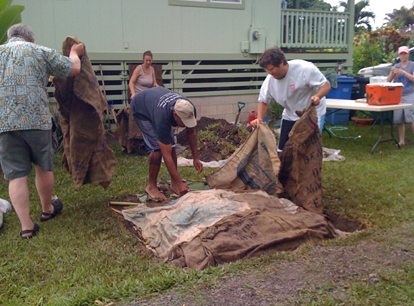 One day last week DH scheduled an important errand in Kaneohe. He was kanalua (hesitant) about leaving the little girl in my charge. “Are you sure this is okay?” No problem, we’ll be fine, I said as he watched me change a diaper. He prepared the next feeding for me. He even conscientiously phoned the baby’s mom to alert her of the shift change. So I got to have some dedicated quality time with Miss Marvelous. She’s seven months old now, and starting to become mobile. She’s not crawling yet, but she wants to. During tummy time (“Back to sleep, tummy to play,” right?) she rolls from her front to her back in all directions and can inch forward on her tummy just a little. I placed manipulatives—the correct name for these age-appropriate toys, I learned—in front of her, slightly out of her reach, as an incentive. One of them was a soft cuddly hippopotamus named Hillary who she loves and responds to. For more encouragement, I got the bright idea to give Hillary a voice. A voice that wasn’t Popo’s, but a higher voice. Miss Marvelous is into very high-pitched shrieking-screeching-whatever this week. Discovering her vocal chords and finding her voice, perhaps? I have a 6-year-old puppy dog, so I know to reward desirable behavior and to ignore less desirable or plain unacceptable behavior. Therefore, I am ignoring this sound. It was fascinating to me, then, that when Hillary spoke aloud to Miss Marvelous, how MM responded. Her big blue eyes lighted up even more than usual, she smiled at her friend who was speaking to her and became very animated, actually engaging with the four-legged stuffed toy who by this time was demonstrating how to crawl. Popo became invisible and all attention was on Hillary. I’ve learned that as soon as the baby rubs her eyes, pulls her ear, or starts to fuss, that it’s time to put her down for a nap. Lucky for both of us, when I put her in her crib and switched off the lights, she was out in less than a minute. Conversing with Hillary and all that exercise on my tummy is tiring, Popo! Mommy phoned, how’s everything? Baby’s fine, she’s sleeping . . .
Later we read the mail-order catalogs together. Great fun. I tried to multi-task and watch Oprah at the same time, but that was difficult. I don’t allow Miss Marvelous to watch TV yet, but boy, TV is a magnet, and as soon as the baby hears it, she’s drawn to the screen. So I switched back to Soundscapes. Next, still “reading” the catalogs, Miss Marvelous played the didgeridoo without the instrument, spit flying and all, entertaining herself for about what seemed like an hour. With this ability she can blow the Hawaiian pu (conch shell) too. 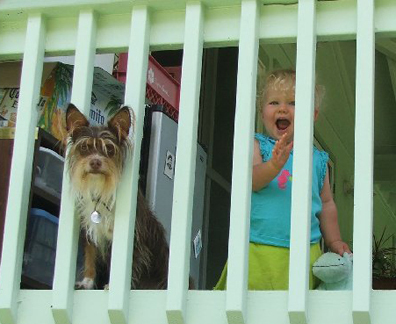 Miss Marvelous and Hillary: we made this photo and emailed it to Papa and Mom to show them everything was A-OK! Another voice. Thank you, dear one. These experiences reinforced what I believe is a need to claim one’s space and find one’s voice in our changing times, or at any time. Put another way, stop procrastinating, do it now, and speak our piece/peace. What are we waiting for? That is how I created my healing space and my breathing room and Rebekah’s Studio that make me happy.